A precious little miracle to add some cheer to your day… which we all need! Here is a great short story with a few sweet photos. 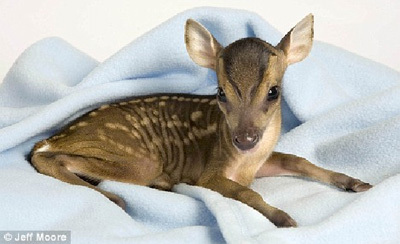 This little premature deer is named Rupert and is living at Tiggy wiggles Hospital in England. Fitting name, right? Can you believe this?? You will probably never see this again. 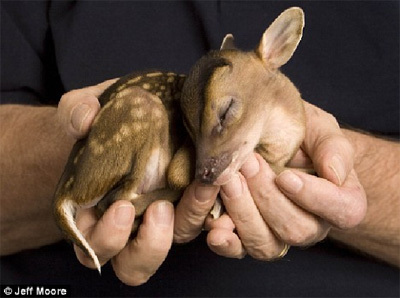 A little miracle!…with all the gloomy news floating out there…here is a nice nature story that is uplifting…This tiny deer was delivered by caesarean section at a wildlife hospital after his mother was killed by a car. 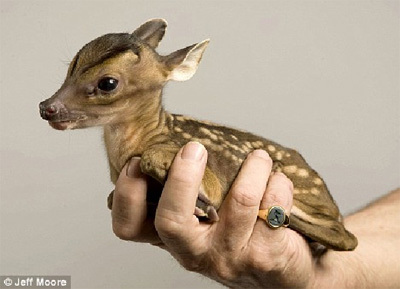 Little Rupert, who is so small he can fit in an adult’s hand, was born after vets failed in their battle to save his mother. 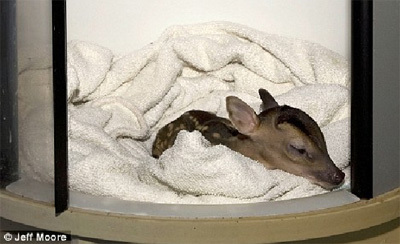 At just six inches tall and weighing just over a pound, he is now in an incubator in the intensive care unit at Tiggywinkles Wildlife Hospital in Buckinghamshire. has only recently opened his eyes. Les Stocker, founder of Tiggywinkles said: Rupert’s mother had very severe injuries. 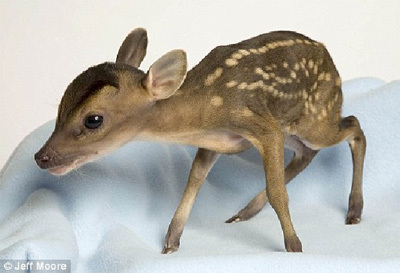 The dear little deer, Rupert, pulls a striking pose for the camera. Staff are optimistic Rupert, now five days old, will make a full recovery. Deer are very, very tricky but this one has spirit. He’s an extremely feisty little guy and quite pushy, Mr. Stocker said. Asleep: Rupert takes 40 winks. How sweet.